A wearable headset detects eye movements, while their software uses them to ‘click’ on a computer. Combined with a headset that detects your eye-blinks, nous™ software learns your natural blinking style. Then you can use intentional blinks to control a range of assistive software applications. Just blink to click. 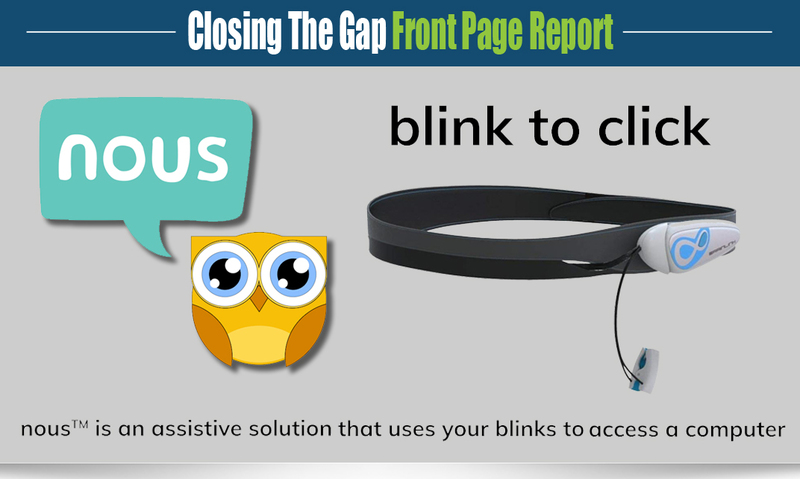 nous™ only uses your intentional blinks, so you can blink normally while you use it. nous™ can help you to use computers to communicate, play games , connect with the world around you and much more. nous™ is a switch access method that simply uses your blinks to access a computer. A switch access method is a simple device that has two states – on and off. They often come in the form of buttons that can be hit with a body part that a person can move reliably and consistently. Switches require minimal physical input, so they can be used by people with physical disabilities, who can’t use more traditional computer access methods, such as a computer mouse, touch screen and keyboards. nous™ is a unique switch access method lets people control assistive software by blinking. nous™ is both hardware and software. The hardware component is a soft headset that houses the sensors which measure your blinks. These sensors measure the electrical signals of eye movement, called “electrooculography” or EOG (this signal is independent of your eyebrow or forehead movements, and is only produced by the movement of your eyeballs). With nous™, the headset measures the EOG signals produced when a person blinks. 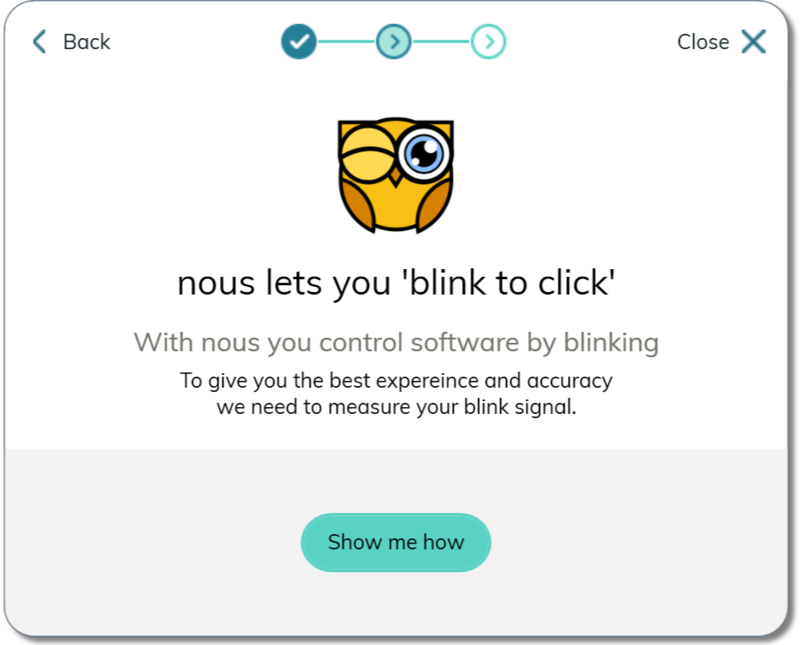 The software part of nous™ needs to understand what a person’s “blink signal” looks like before they start using it as a switch access method. They want people to still be able to blink naturally, otherwise it may be uncomfortable trying to use nous™. So users of nous™ will go through a calibration process that teaches nous™ what a person’s intentional/purposeful blinks look like. Once the calibration is complete, nous™ can be used as a switch access method for Windows OS based computer applications, such as Communicator 5 by Tobii Dynavox, NuVoice by PRC and Grid 3 by Smartbox, as well as other software applications that can be used with switch interfaces. nous™ might be a useful switch access method for you, if existing assistive technologies are too difficult to use. They may be difficult to use because you may not have the physical means of accessing them, or they may be tiring to use. Because nous™ only requires you to have the ability to blink reliably, it could be the perfect solution for you. Their video tutorials are designed to make it quick and easy to set up and use nous™ for all of their customers. nous™ differentiates between your natural and intentional/purposeful blinks. The communication partner, will need to provide nous™with instances of intentional/purposeful blinks during calibration. This means that they will need to know what your natural and intentional/purposeful blinks look like. During manual calibration, nous™ will ask the you to produce four intentional blinks. 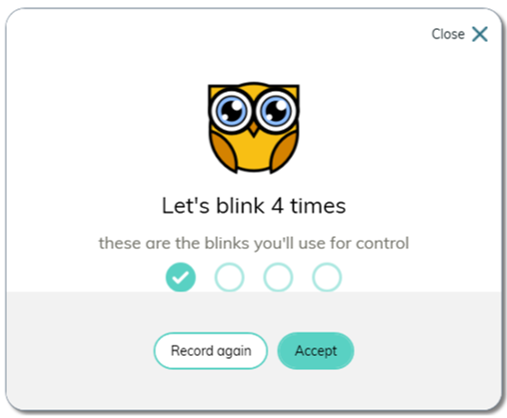 Based on how different your intentional/purposeful blinks look compared to your natural blinks, your communication partner will choose to accept the blink or re-record it. In the video below, Kirsten is running through the manual blink calibration with Stuart. You’ll see that she makes sure that she is looking at Stuart when he blinks, rather than at the screen. This ensures that she can determine whether the blink looked too much like a natural blink, was too hard (hard blinks are uncomfortable to reproduce and can disrupt the blink signal), or was indeed an intentional blink. You’ll want to ensure that the intentional/purposeful and natural blinks look different. Again, most of the time intentional blinks are faster and harder, they also tend to engage the lower eyelids. However, this isn’t always the case. They have worked with people who’s intentional blinks are slower and softer. This is fine – as long as the intentional blinks look different to the natural blinks, nous™ can be used reliably. NOTE: For people learning to perform intentional blinks, communication partners can go ahead and accept the blinks the end-user performs when asked to blink intentionally. From our experience, with practice, people’s ability to blink intentionally can improve significantly, making nous™ a reliable access method.